Mild hearts vacation in Hoboken. 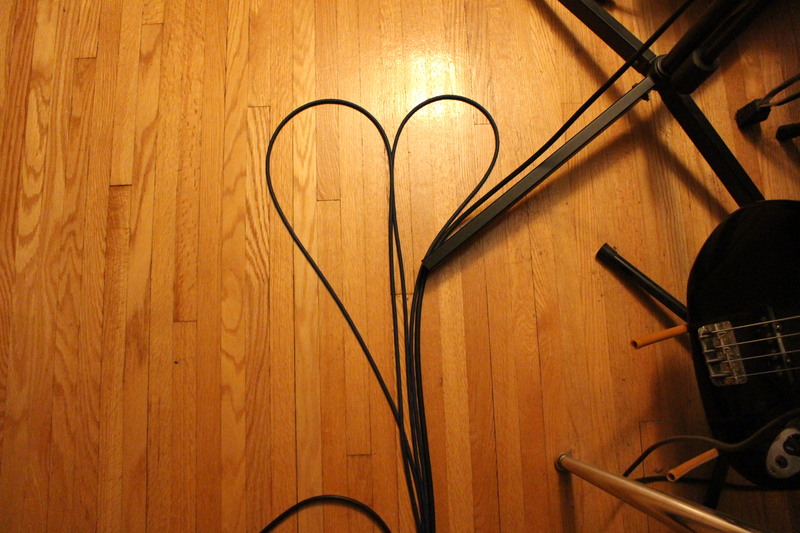 Mic cables are forming heart shapes again. It’s only the second time this has ever happened to me. Could it mean love is in the air? I don’t think so. But it’s fun to look down and see a thing like this in the studio. I’m realizing I don’t use this blog as a “keeping tabs on myself” tool much anymore, when I used to do a whole lot of that. As bland as those posts probably were to read, they helped to keep me honest and motivated at a time when I needed an extra little kick in the posterior. So here’s where things are at right now. When I feel like I haven’t been making much progress, I take a look at that thing. 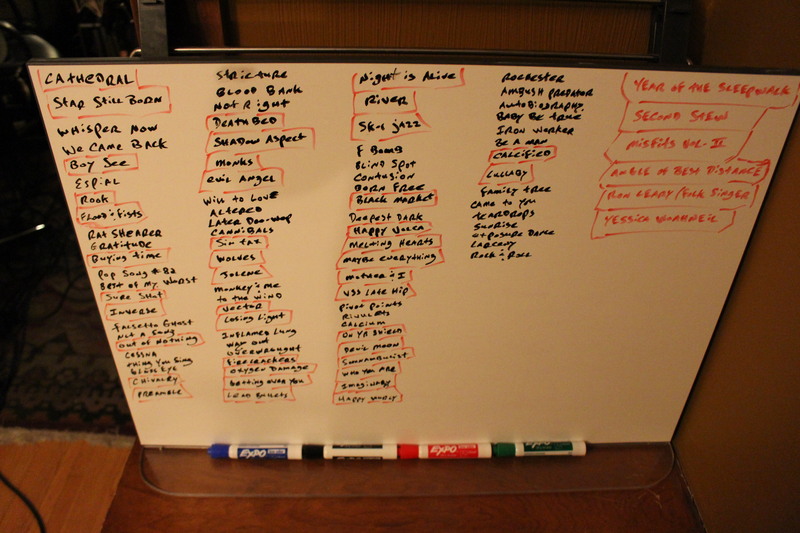 There are thirty-three songs enclosed in red boxes that weren’t in boxes before (thirty-four if you count an accidental duplicate), including some that are recent or brand new additions to the board. 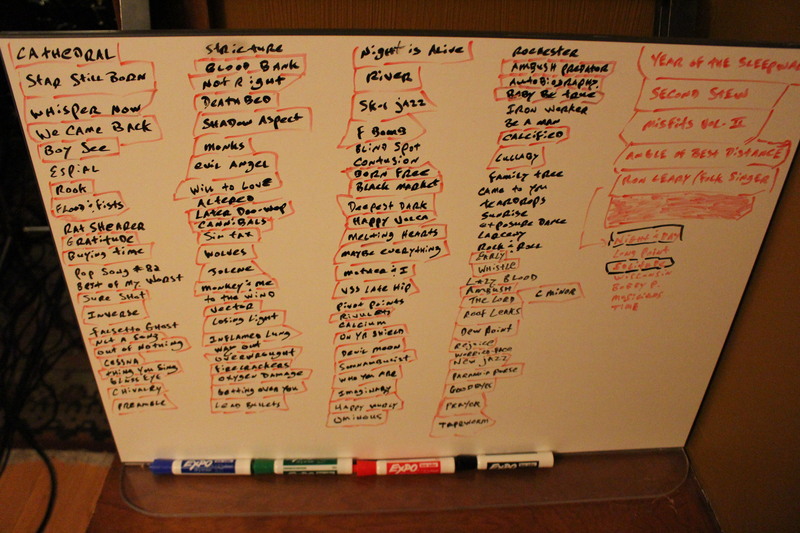 Pretty soon, all one hundred and two of those songs, and maybe a few more, will exist in recorded form. That’s not so bad for having to multitask as much as I do these days. Ron’s album aside, the next Papa Ghostface album is closest to the finish line out of everything that’s on the go right now. Thirty-three songs have been recorded for it, though a few of those are holdovers from the STEW sessions. I figure about a dozen of them will end up on the cutting room floor for one reason or another. There are another two or three I still want to record — catchier, more uptempo things to offset some of the slower and more morbid moments — and then it’s just a matter of filling out some arrangements, mixing things until they sound about right, and figuring out a good sequence. The cover art is already taken care of. It’s the last Papa Ghostface album there’s ever going to be. I didn’t know that going into it. But it feels like a good note to end on. More about that when the music is ready for public consumption. One hundred and one songs have been recorded for YEAR OF THE SLEEPWALK. That sounds ridiculous until you think about how long I’ve been working on this album (four years). When I don’t finish an album within a “normal” period of time, there’s bound to be a lot of material. There are about ten more tunes I want to record, a few more guests I’d like to try and get over here for some musical cameos, and then I can start hammering nails into that massive thing and making an album out of it. The less said about THE ANGLE OF BEST DISTANCE, the better. I’m still confident I’ll clothe and bathe that beast someday, but right now it’s taking a very long nap. While The O-L West is on hiatus for the time being, I’ve heard some rumblings about new Tire Swing Co. material. Looking forward to hearing and recording that whenever Steve feels the itch to get back in the studio. And there’s another collaborative project with a friend that’s being picked at here and there, but I don’t think we’ve even decided on a band name yet. It’s tough to come up with something good these days. I thought it might be amusing to call ourselves All the Good Names Were Taken, but there are at least two bands calling themselves that already (in Michigan and New York, respectively). Phooey. A friendly reminder for those who may be interested: I’ll be popping in at CJAM on Monday, June 25th to play a few songs on Ron’s Travelling Salesman radio show at about 5:30 p.m. Eastern Daylight Time. When the moment of truth arrives, you can listen live online over HERE if you’d like. Of course, if you miss it, it’s no big thing. As always, I’ll post an MP3 here to commemorate the occasion.